As a little boy growing up in Jordan, Mo’ath Alkhawaldeh aka “Mo” was a bit of a troublemaker. He fought constantly with both his classmates and teachers and, by consequence, was moved from class to class and then from school to school to no avail. One day Mo was at a supermarket buying himself some cigarettes when he spotted a brochure for a local 21 kilometer road race. Mo was intrigued, and so, never having run a mile in his life, he laced up his “hang out at the mall” shoes, toed the line, and was a changed man one hour and 50 minutes later. Running’s competitiveness combined with its camaraderie served as the best outlet for Mo’s anger and anxiety, and the effects were immediate. Mo’s grades improved, he learned to get along with his peers, and his running took off – enough to land him a full athletic scholarship at the New York Institute of Technology. Having witnessed it firsthand, Mo believes in sport’s potential to change individual behavior to ultimately influence greater conflict. 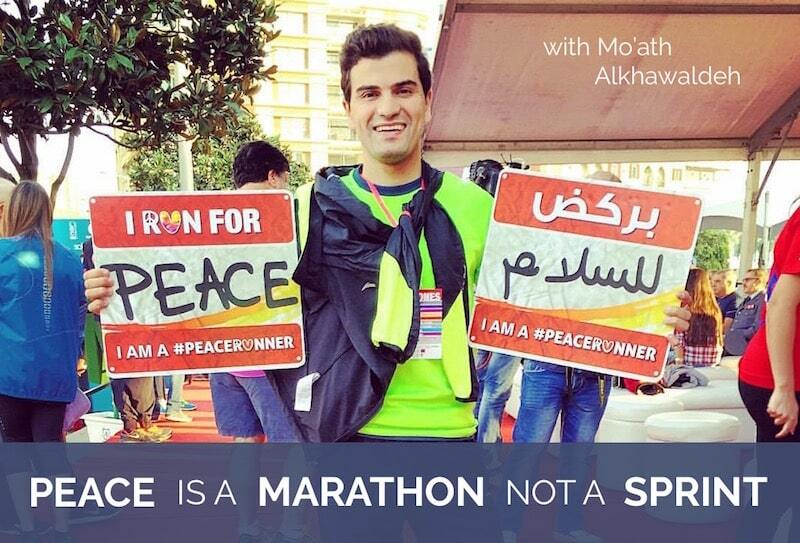 He’s an ambassador of the Beirut Marathon Association and has worked with the renowned nonprofit organization Generations for Peace for over three years, implementing youth programs in the war-ridden communities of 22 African and Middle Eastern Countries. Mo is also an accomplished runner. Currently ranked as one of the top two marathoners in Jordan, he is training to compete at the 2020 Games in Tokyo and wishes to inspire Jordan’s youth to pursue their own athletic potential. Listen in as Mo shares his mission to change the world through sport. 4:24 What was it like growing up in Jordan and how did you first get into running? 9:26 How did you feel when you first started running? 11:30 Was it hard for you to leave Jordan? 13:34 What were your post-collegiate intentions entering college? 15:41 How do you feel building peace through sport is effective? 16:46 What is Generations for Peace? 17:57 What did your daily activities entails as you worked with these communities? 18:50 What was the most difficult part of your job? 21:02 Does your own running career inspire the kids to go after one themselves? 23:07 What changes have you seen in the communities in which you’ve worked? 24:49 Have these kids seen improvement in their academics, too? 27:31 What is the selection process for these programs? 29:21 What activities make up these programs? 30:26 Are parents and families cooperative with these programs? 31:29 How did you collect feedback from parents? 33:18 was it difficult to communicate with and supervises your delegates in other communities? 34:55 What are your current activities with Generations for Peace and other peacebuilding? 38:18 What will you be doing in New York as an ambassador for the Beirut Marathon? 40:20 Is your schedule now more conducive to training as an elite runner and are you more confident in the leaps you want to make in your running career? 42:00 Tell us about speaking before the Vancouver Marathon and the conference for the France run. Send an email to info@pacifichealthlabs.com with the subject line “Run to the Top” and ask for your FREE Accel Gel samples. Don’t forget to include your address!